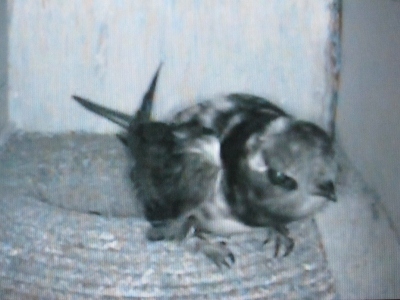 Our Swift attracts a mate! 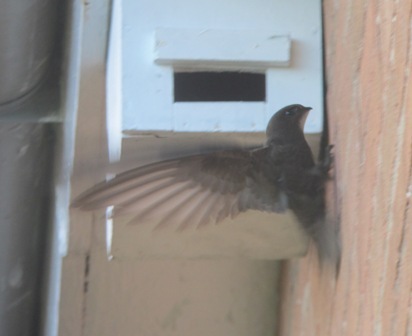 After a series of fast aerial pursuits our Swift lured a mate into the box. There is no way of telling whether this is the same mate as last year, but the pair were immediately very comfortable in each other’s company and the new bird was very practised at entering the nest box despite very strong cross winds. After an hour so preening each other and resting side by side they left to feed. 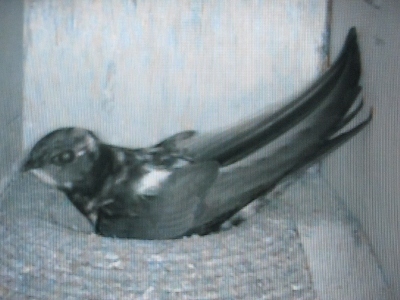 Swifts in nestbox 14th May. Copyright Jonathan Pomroy 2012. Our partial albino Swift returned on the evening of 11th May at 7.50pm. It promptly settled and stayed quietly in the box for over thirteen hours. A rest after arrival from Africa. It arrived with a large number of Swifts who travelled into Britain on warm south westerly winds on the south side of a low pressure system. 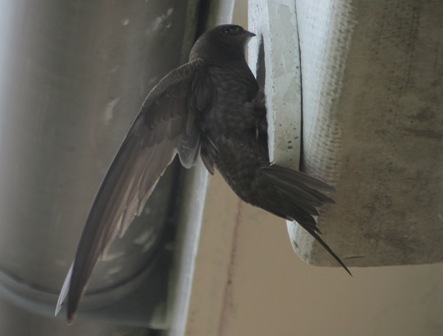 This Swift has been visiting our house since at least 2010, breeding for the first time last year. 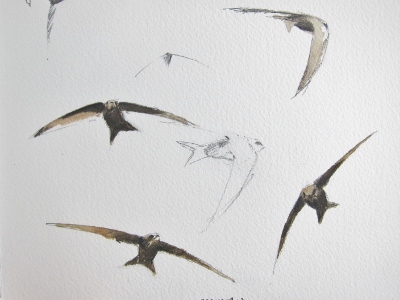 This year I have added a camera to obtain these images of this very distinctive Swift. Found a Swift feeding above Newburgh Priory Lake this afternoon. Wonderful to see that distinctive shape in the sky again. This is my earliest sighting for a very long time. Last year my first was seen on 22nd April. This is the nest built by a pair of non breeding Swifts in one of our nest boxes. One of the pair first entered the box on 21st June. After days trying to entice a mate in the second bird entered the box and joined it to roost on 28th June. They soon set about gathering nest material, all of which is collected in the air. Many feathers and pieces of grass were brought in right up until 13th August. Shortly before they migrated south they added masses of thistle down(a material easily gathered in flight) which covered the whole nest area.It really is a beautiful sight. I now have to hope that both birds have a safe journey to Africa and back. All being well they will return to raise their first brood next May. 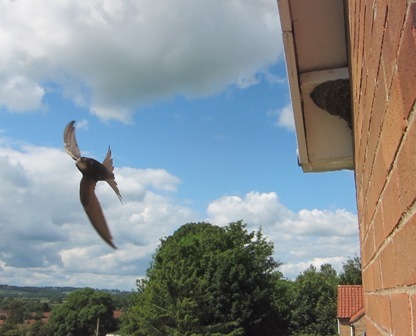 Recent warmth has enabled the Swifts to feed on the abundance of flying insects, which gives them plenty of energy. Their flying in such conditions is spectacular, with screaming flocks passing the eaves at high speed throughout the daylight hours, literally starting at 4.30am and finishing at 10pm. Most of these screaming Swifts are non breeding birds who are looking for nest sites and in some cases joining existing colonies. We don’t know why they scream in tight flocks, it could be a social activity which bonds the colony or perhaps some form of courtship, we can only guess. Recently these non breeders have been turning their attention towards the martin nests, hurling themselves at the mud structures to look in the entrances. The martins stay in their nests and defend them. 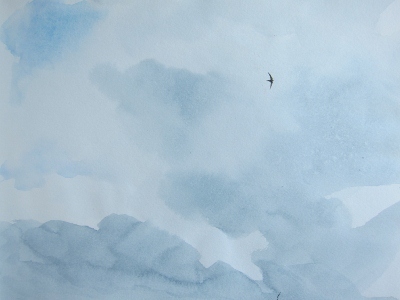 Sometimes they even chase the Swifts in the air. 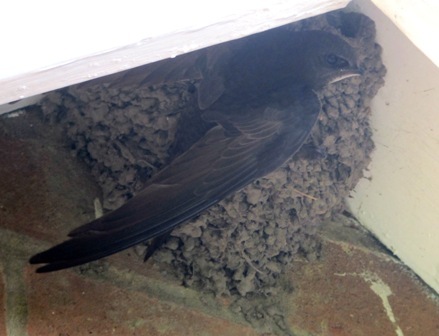 It is unlikely that the Swifts would use the martin nests though this has occasionally been recorded. 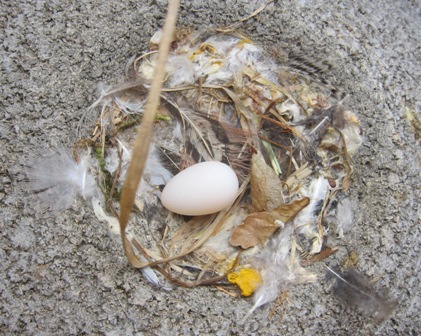 The martins added additional mud to their nest entrances and made the nests even stronger. Three out of the four pairs on the front of our house did this at the same time as a response to the increase in Swift activity. The slightly heavier Swifts were knocking small amounts of mud from the structures, mainly through the speed at which they landed. 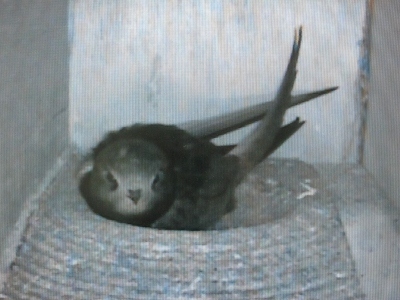 We now have another pair of Swifts in residence. 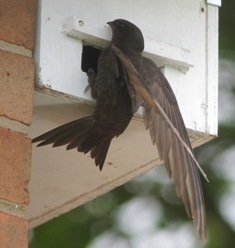 They have taken to a Swift nest box and visit frequently. They will probably build a nest during the rest of their stay and return to breed next May. 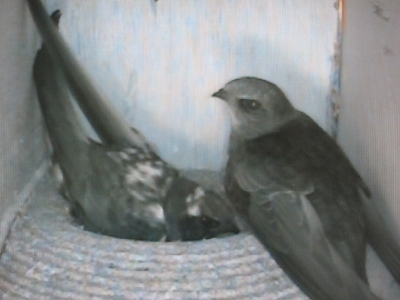 On June 15th- 17th we were visited by many non breeding Swifts. These curious young birds queue up to look in the nest sites of the breeders. The breeders quickly return to their boxes and scream in duet at the visitors who hardly ever attempt to enter the nest site. They were also showing an interest in the vacant nest boxes though their early attempts at alighting on them are haphazard to say the least. There does seem to be another pair keen to find a site on our house and they seem particularly intersted in a hole under the pantiles. They may well build a nest this year and return to breed in 2012. The flying displays have been spectacular with extreme high speed passes by the eaves, impossibly tight fast turns as if they are on a wire, then back past the eaves, screaming wildly especially when close to the potential nest site. This flying is so precise, millimetres at times from certain death, but they never miss and continue to thrill me, as they have every year since I first remember them flying round the eaves of my primary school. The partial albino Swift and its mate have built a nest. I placed some of the material in the box to get them started but they have added their own too, such as the small oak leaf, grass pieces and the occasional petal all gathered in the air. They will probably lay one more egg in 48 hours then incubation will begin. 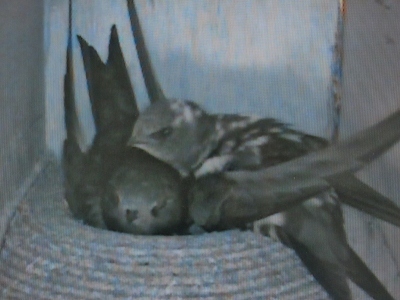 Swifts glue the nest materials together with their saliva. 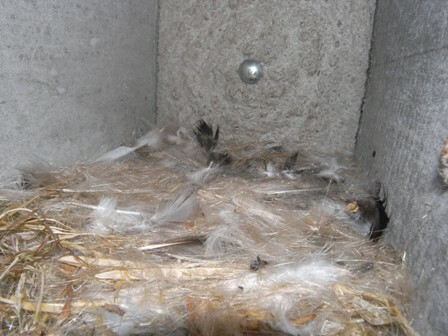 The nest is built onto a specially designed nest mould.